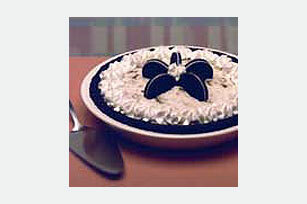 Get a double dose of OREO cookies when you make this Creamy Oreo Pie! Make this luscious no-bake pie with cookies and cream cheese filling today. Crush 24 cookies to form fine crumbs; mix with butter until blended. Press onto bottom and up side of 9-inch pie plate. Refrigerate while preparing filling. Chop 8 of the remaining cookies. Beat cream cheese and sugar in medium bowl with mixer until light and fluffy. Add chopped cookies and COOL WHIP; stir gently until blended. Spoon into crust. Refrigerate 2 hours or until firm. Halve remaining 4 cookies; insert, cut-edges down, into top of pie. Save 50 calories and 9g of fat per serving by preparing with Reduced Fat OREO Cookies, PHILADELPHIA Neufchatel Cheese and COOL WHIP LITE Whipped Topping. Place completely unwrapped package of cream cheese on microwaveable plate. Microwave on HIGH 15 sec. or until slightly softened. Let stand 1 min. before using.